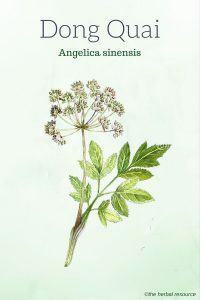 Other Common Names: Chinese angelica, female ginseng, dang gui (Chinese), toki (Japanese), tanggwi (Korean), Chinesische Engelwurz (German), Kinesisk angelikarot (Swedish). Habitat: It is found growing wild in China, Korea, and Japan. In China, it has been cultivable for more than 1500 years, mostly in the southern and western parts of the country. 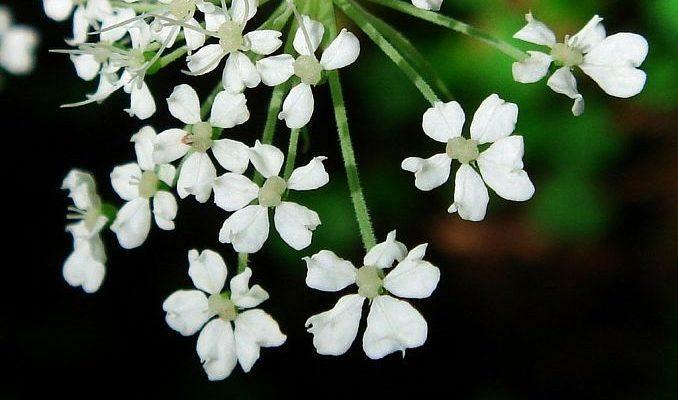 Description: Dong quai is a member of the Umbelliferae family and is a fragrant perennial plant which can grow up to 2 meters tall, and produces white flowers in early summer. Dong quai is typically found growing in damp mountain ravines, meadows, river banks, and near the sea. It is considered in traditional Chinese medicine to have a warm nature and a sweet, acrid, and bitter taste. The main traditional use of dong quai is to regulate the female reproductive organs. The root is one ingredient of “four things soup”, a traditionally used woman’s tonic in China. Plant Parts Used: Root. Powdered /dried root/root slices, fluid extracts, tinctures, decoctions and dried leaf preparations are available to be taken by mouth. Topical preparations can also be used. The key components of dong quai are n-butylidenephalide, ligustilide, n-butylphthalide, ferulic acid, nicotinic acid, and succinic acid. There are also significant amounts of vitamin A, carotenoids, vitamins B12, Vitamin E, ascorbic acid, folinic acid, biotin, various phytosterols, calcium, and magnesium. Chinese herbalists have used dong quai for thousands of years to strengthen heart, lung and liver meridians and today it is widely used by Chinese families as a tonic and spice. Dong quai is often called “female ginseng” and it is as highly regarded as Panax ginseng. It is a very popular herb in China and the only other herb in Chinese herbal medicine that is more used is Chinese licorice (Glycyrrhiza uralensis). Based on traditional use it is thought to be useful for pre menstrual syndrome (PMS) specifically lack of bleeding, painful periods, menstrual cramps and menstrual migraine. Dong quai has also been used traditionally for recovery from childbirth and related ailments, fatigue, and low vitality. The herb is thought to contain natural hormones (phytoestrogens) and has been used in traditional Chinese medicine for menopausal symptoms such as hot flushes. Dong quai, often in combination with other herbs, is believed to be of benefit for a verity of women’s health issues such as menopause and problematic periods. It is suggested that it may be useful for natural treatment of rheumatoid arthritis and osteoarthritis. 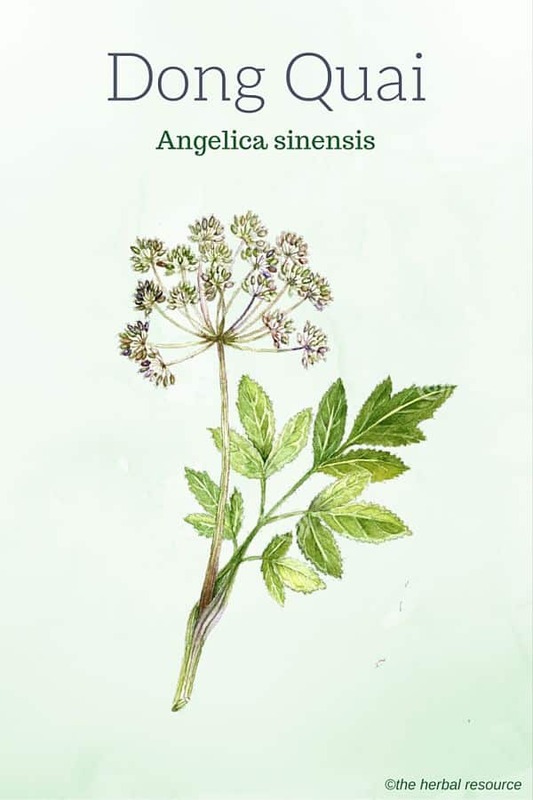 The root of Angelica sinensis contains active compounds that increase the cardiac rest period between heartbeats and relax blood pressure inside the arteries which in turn helps to increase blood flow. Dong quai may reduce spasms in the smooth muscles around the arteries which could help improve blood flow to the veins. Animal testing indicates that dong quai reduces the formation of plaque in the blood vessel walls and the herb could therefore be relevant as a preventive agent against atherosclerosis, angina pectoris, myocardial infarction (heart attack) and hypertension. These effects are believed to be due to the substances coumarins and ferulic acid found in the root. Preliminary results from research conducted on animals suggest that dong quai may have strong tumor inhibitory and immune-enhancing effects. The polysaccharides found in the root might be able to increase the ability of the natural killer cells and other immune cells to destroy tumors. Researchers continue to study the potential of the herb as a treatment for cancer and HIV (AIDS). 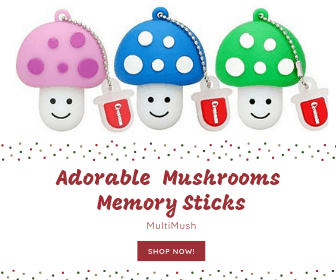 It can hold back the development of fungi, viruses, and bacteria. Pulverized roots for example been used successfully to treat shingles (herpes zoster). The herb has an antibacterial effect and may be helpful to suppress the growth of various bacteria like hemolytic Streptococcus, Bacillus typhi, Bacillus dysentricae and Bacillus choleraei. There is some research on the use of dong quai for nerve pain. Capsules and tablets: 500-600 mg up to six times daily. Tincture (1:5) to treat menstrual cramps: 5-20 drops up to three times daily. Tea in the form of extraction or decoction to treat anemia and for poor blood circulation: one cup 2 or 3 times daily. Dong quai has been associated with stomach upsets, nausea, and vomiting with prolonged use. People with a known allergy to the Umbelliferae family (e.g. 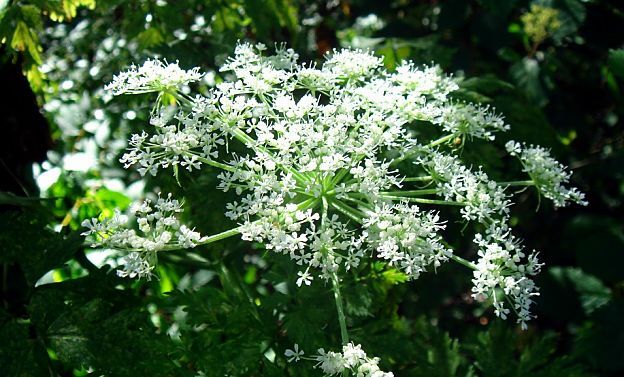 anise, caraway, celery, dill) should avoid it as it can cause skin rashes. It contains a group of compounds called psoralens which can increase sensitivity in the sun. Dong quai contains ostiole and ferulic acid which may inhibit platelet aggregation and thus should not be taken with anticoagulants and drugs that increase the risk of bleeding. Pregnant and breastfeeding women should not take this herb. Pedersen, Stephanie: Dong Quai. Woman’s Wonder Drug. New York, Dorling Kindersley Publishing, Inc., 2000. Murray, Michael T.: The Healing Power of Herbs. The Enlightened Person’s Guide to the Wonders of Medicinal Plants.Rocklin, Prima Health 1995 (2.ed). Dong quai – University of Maryland Medical Center.